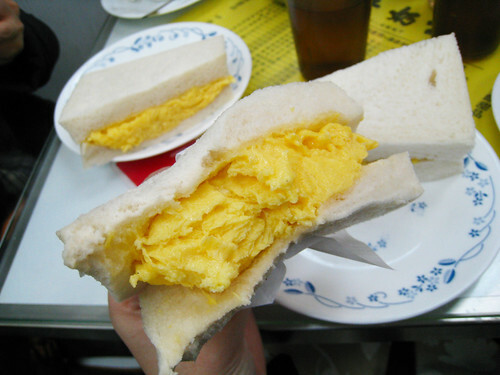 cha chaan teng | tasty treats! waiter, is that a pantyhose in my tea? 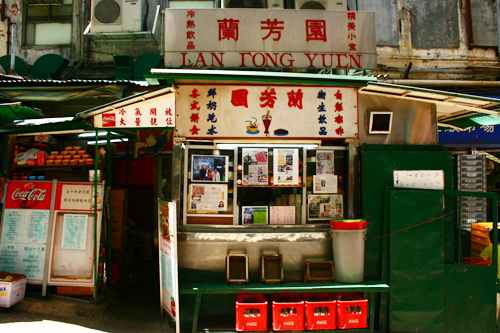 Many times I’d walked past 蘭芳園 (Lan Fong Yuen) and gazed at it in wonder, but never stopped because I thought it to be more of a take-away stall (though I noted that you could perch on the small wooden stools on the raised platform in the front). Sneaky peeps – turns out there’s an entire restaurant hidden behind that facade! Entrance is from that small corridor on the left of the stall. I was meeting two friends who happened to work in the Central district, so we arranged to have lunch there. 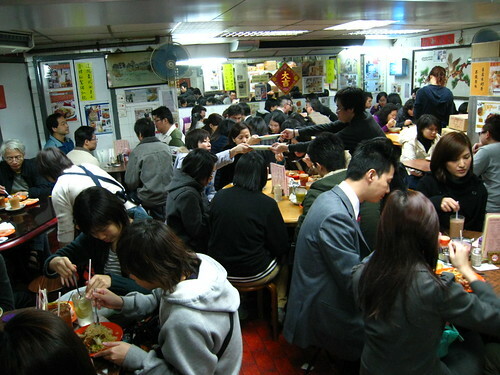 Unfortunately, between the hours of 12:30-1:30, all the restaurants (even so-so ones) in the area are attacked by the brigade of OLs (office ladies) and besuited bankers and other working folk. 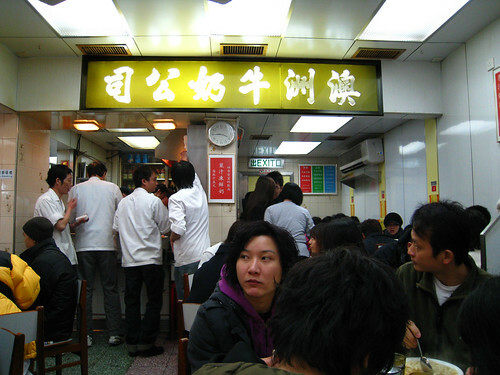 When I got to Lan Fong Yuen at 12:50 the place was already heaving and there was a queue steadily forming outside. Because of its popularity, they have a policy that if all members of your party aren’t present, you can’t get a table. Two of us ended up waiting for the last person just outside of the restaurant, behind the stall, which was basically their kitchen. We watched the efficient staff do their magic in the tiny space – one man was in charge of making the famous ‘pantyhose’ milk tea (practically five orders a minute, from what we saw), another in charge of their equally famed thick toasts with peanut butter/condensed milk as well as their pork chop buns, and another piling on the toppings onto platefuls of steaming-hot ramen before the waiters would whisk them off into the restaurant. 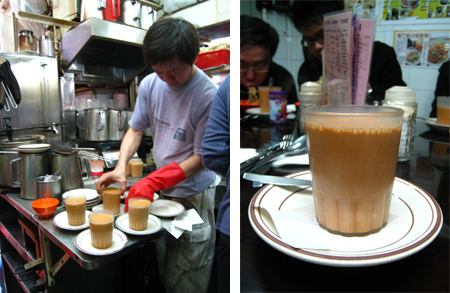 Left: A worker busily makes cup after cup of milk tea. There are about 4-5 kettles on the boil at once on the stove. Right: My cuppa. Note the happy men in the background slurping up their ramen! We were eventually seated at a table in the corner, along with two other groups of people – they come and go quite quickly, so in the span of half an hour there was a cheerful group of young male office workers, a young-woman/old-man couple, two teenagers, and then a tourist couple from mainland China. It’s certainly elbow-to-elbow dining, but it’s fun because you get to peek at what everyone else is ordering (the satay beef noodles looked a bit putrid, but judging from the reactions, it was divine; seeing different dishes also made me wish I’d ordered a pork chop bun – it’s so round and cute!). I already knew what I wanted to order – I had their signature braised ramen noodles with pan-fried chicken breast and scallion oil, and a hot cup of pantyhose tea. Who knew that such simple fare could be so good? I’m not generally a fan of instant ramen, but at the very least, it was cooked very well – al dente and not soggy and watery. The pan-fried chicken breast was also surprisingly good – juicy, and with a crisp skin and SO. MUCH. FLAVOUR. 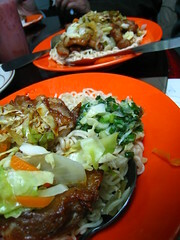 There was sliced cabbage for texture, and the scallion oil was magnificent, it really brought the whole dish together. Humble food but oh-so-good (and probably oh-so-unhealthy!). It cost $36 for the lunch together (roughly £2.50) and we left feeling happy and satisfied. It’s worth noting as well that the service was really friendly – which you don’t really expect it to be, considering how busy and popular the place is (as a rule of thumb, the more popular a place is here, the less staff feel like they have to try hard with good service). It’s worth mentioning that ‘pantyhose’ tea doesn’t really refer to what’s in it (bless you), but it does refer slightly to how it’s made. The brew is filtered through a nylon fabric that hangs like a stocking, thus its name as ‘pantyhose’ tea – reason being it really filters out any imperfections and grains in the tea, as well as somehow integrating the evaporated milk and tea together more smoothly, which results in a super silky brew. The strength of the tea is also a result of it being brewed for exactly 13 minutes, according to the owner. At times, I’m tempted to try it on my own with an unworn pair of stockings just for fun. (A trick that my dad uses to make his tea smoother, actually, is to add discarded egg shells into the pot – allegedly, some famous milk tea vendors also add this to their brew – the remaining egg white sticking to the inside of the shell somehow helps to add a smooth texture to the tea. You still have to filter it, of course, but in this case we just use a fine sieve.) By the way, the above image is courtesy of Reuters, who wrote a pretty good article on pantyhose tea, as well as Lan Fong Yuen (take a look at the related video!). 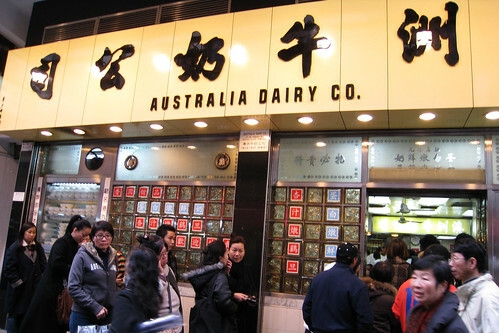 Afterwards I had a good stroll around the markets of Gage Street (where Lan Fong Yuen is located) and Graham Street. I swear I never get bored of doing so (I’ve already been twice in the week I’ve been back in Hong Kong). There’s just something so alive about these markets and streets that I can’t help but feel a pang of sadness every time I think about how they’re going to tear it down. A post about the area will probably follow, eventually.